Join the procession as The Tiny Travelling Tightwire Show! rolls into town! Watch Kennington and his assistant Poppet the Puppet as they chance their feet on the tightwire. This is a fun and entertaining, roaming tightwire show for all ages. 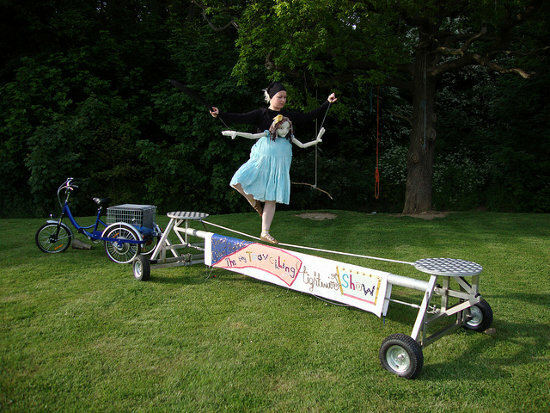 The low tightwire on wheels is pulled by a vintage tricycle, which stops to perform the show. The set is a mobile low (3m long) tightwire on wheels pulled by a vintage tricycle. All audio and equipment is incorporated into the set up, so the show is completely self sufficient. To perform the company need a small open space at approx 4m wide by 6m (enough space to turn); they wheel the set in and out – this is how the show starts and finishes. The show has been performed indoors, but needs a large, flat area with good access for wheels, to wheel in and out. None - self sufficient free-standing tightwire.